I watch the blood. I watch the crimson fall from my arm. It no longer hurts when I do this. It feels good, it is relief. The blood drips, drips like water from a faucet. My book of poetry is filled with these such bloodstains. My arm is littered with these such scars. I know you’ll be mad when you see this. I know what this represents you you. I know you’ll try to hug me. And I think I just might let you. I know that this blood represents broken promises. I know this choice I made means that I’m still broken. Still broken, you say it like I was fixed. Your words come to me now. I can hear your voice, it’s almost like your here. But I know your not. I watch the blood. I watch the memories in my mind, like old movies playing the movies over and over. I trace the old scars and the faded lines. I can still hear your voice. I don’t look up. I watch the blood. 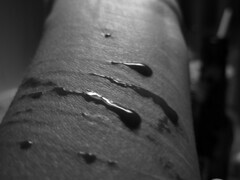 It relieves me. Now I’m hearing voices, your voice. I feel your arms around me. I feel you hold me. I wish we could stay like this forever. It is insightful. At the risk of admitting anything I may or may not have done in the past…um…this is an amazingly perfect description of the emotions. Great writing! wow just wow. This was a fantastic description of how i’ve felt before. This made me cry because it brought back memories. I know this is a late comment, but I think this was a great poem! Great Job!